S M Ong: SingPost versus McDonald's: It's the SG50 Hello Kitty deathmatch! SingPost versus McDonald's: It's the SG50 Hello Kitty deathmatch! This weekend is SG50 weekend. And what represents SG50 more than Hello Kitty? Since Feb 23, you can order the SingPost SG50 Hello Kitty Plush Collectible Set online for $88. But I got a $10 discount by signing up for the mailing list. So I paid only $78. There is also a $108 Singpost Sg50 Hello Kitty Limited Edition Bundled Set, which includes a Hello Kitty MyStamp folder and lanyard, but that's already sold out. 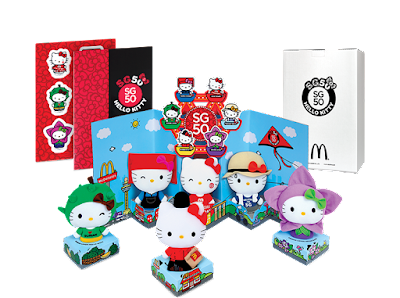 McDonald's started taking online orders for its own $80 SG50 Hello Kitty Collector's Set last month. Naturally, I got both the SingPost and McDonald's sets. Which set should you get? This is what the packages looked like when they first arrived. The McDonald's package came with six Extra Value Meal vouchers worth $5 each. The SingPost package came with a glossy 16-page booklet with gorgeous photos of the collection. I'll show the inside of the booklet later. However, the SingPost Hello Kitties are bigger than the McDonald's Hello Kitties. I also prefer the designs of the SingPost Hello Kitties. They seem better thought out. First, we have the obligatory SG50 costume. Then, of course, SingPost would have one Hello Kitty in a postman's uniform and McDonald's would have one in a crew uniform. Hands down, the colonial postman uniform is much cuter than the McDonald's uniform. 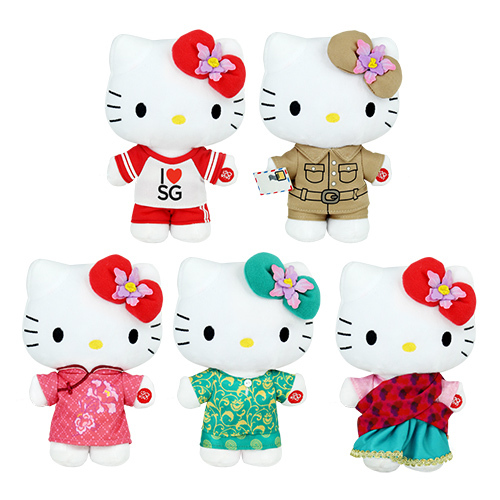 The remaining three Hello Kitties in the SingPost collection are in outfits representing Singapore's three main ethnic groups. This makes sense. By comparison, the designs for the other four McDonald's plushies seem wildly random. Haphazard almost. Sure, I get the Samsui Woman and Trishaw Uncle. It looks like something from Little Shop Of Horrors. I sort of like the idea of Durian Lover, but the durian costume makes no sense. However, McDonald's does offer something subtly unique in its SG50 collection that I haven't seen in other Hello Kitties. Look at the Samsui Woman, Durian Lover and SG50 Parade plushies again. The SG50 Parade Hello Kitty's eyes are closed! The Samsui Woman and Durian Lover are winking at you! In all other Hello Kitties, both eyes are wide open. So McDonald's is doing something pretty revolutionary here. Apart from the plushies, the McDonald's set also comes with these extras for displaying the collection. So in terms of value for money, the McDonald's set is easily the better deal, especially after you count the $30 worth of food vouchers. But in terms of the plushies themselves, the SingPost collection is more "Singaporean". I just wish SingPost didn't use Times Roman as the typeface for the words "HELLO KITTY" on the boxes. That's unforgiveable. What the hell? Get both sets. It's SG50!